A lion was living with his assistant jackal. The lion used to kill the prey and the jackal used to survive on the leftovers. In lieu of that, the jackal was giving all sorts of services to the lion. One day, the lion got badly injured during a fight with an elephant. After that, the lion became too weak to hunt. As a result, the jackal was also suffering from shortage of food. One day, the jackal was feeling very hungry and asked the lion to arrange for some food. The lion told the jackal that he had become too weak to chase an animal. He asked the jackal to lure some animal to his cave so that he could kill that animal. The jackal went to search for some foolish animal which could be easily lured to come to the cave. After searching for a while, the jackal found a donkey grazing in a field. He showed some sympathy to the donkey and asked him why was he so weak. The donkey told that his owner; a washerman; was very cruel. He always tortured the donkey and did not allow him to eat properly. The jackal told the donkey that he knew about a place which is full of juicy grass and there were three female donkeys as well. 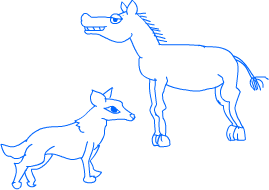 The donkey readily agreed to go along with the jackal. Once they reached near the cave, the lion jumped to kill he donkey. The donkey ran for his life and was able to escape the imminent death. After that, the jackal made fun of lion. After some argument, the jackal once again agreed to try to trap the donkey. When the jackal approached the donkey for the second time, the donkey was furious at him. But jackal told him, “What you thought was a lion was in fact a female donkey. After seeing such a handsome donkey; like you; she was out of her senses and hence pounced upon you.” Donkeys are famous for having hare brain. The donkey once again agreed to go along with the jackal. Finally, the lion was able to kill the donkey and they had a sumptuous meal after a long time.